Potterton Commercial, part of Baxi Commercial Division, recently designed and supplied a Paramount MB packaged boiler plant for the Heathlands Hotel in Bournemouth. The hotel was acquired by Britannia Hotels in 2009, and the hotel’s installed plant was assessed by the Architectural and Energy Services Department which noted that the heating system was aged and in a poor state of repair. 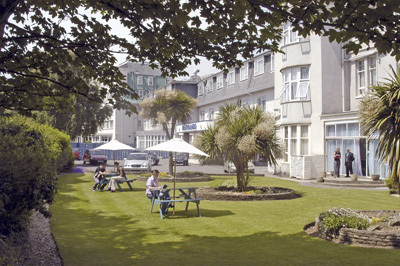 A plant replacement was chosen, and a functional design brief was written by Mike Elwin, the group energy manager, that was issued to five boiler manufacturers, noting a requirement for energy efficiency, commercial advantage and a rapid installation to minimise disruption to the hotel and its guests. A 460kW Paramount MB modular, prefabricated packaged boiler plant was installed to take over the space heating function from the existing boilers. Due to the higher operating pressure of the new boilers, a plate heat exchanger was installed in order to separate them from the existing heating system. From delivery of the boiler plant, the system was assembled in the new plant room in just four hours, ready for the ‘plug and play’ onsite connection works. Based around Potterton Commercial’s Paramount range of high efficiency condensing boilers, Paramount MB is available in outputs ranging from 60kW to 690kW and the complete system comprises boilers, low energy pumps, pressurisation unit and controls. In addition to plate heat exchangers, other options include integral CHP and a GRP enclosure. 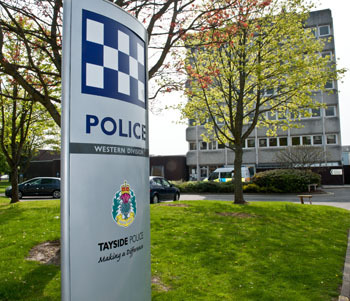 Andrews Water Heaters has supplied a gas-fired storage water heater and a solar water heating package which have been installed in a two-phase refurbishment project at Tayside Police’s Divisional Headquarters in Perth. Tayside Police are proactive in their requirement for energy efficiency and demanded a sustainable system to replace existing domestic water heating equipment, which comprised two large calorifiers served by the three space heating boilers – a system which was inefficient and costly to run, particularly in the summer months. The new system was designed by Elders Consulting Engineers and a spokesman said: “We specified the Andrews Maxxflo water heater as this model had been used at other sites for Tayside Police and we went on to specify the Solarflo system as it made sense to obtain the whole package of matched equipment from a single source. The DHW system serves all the hot water requirements for the building, including the staff toilets and showers, the canteen and kitchen and also the showers in the cell block. The Maxxflo range of gas-fired storage water heaters has won the Queen’s Award for Innovation for it’s energy saving capabilities and, with their fast recovery rate, these units are ideal for buildings with a high demand for hot water, particularly where this demand peaks at particular times of the day. 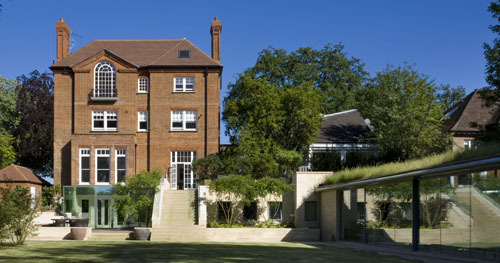 Baxi-SenerTec UK combined heat and power technology was recently employed to save energy and cut carbon emissions in a residential property in London. A Dachs mini-CHP unit generates electricity while producing heat which feeds into the central heating system, supplemented by two newly installed condensing boilers. The property is a substantial Victorian detached house with a modern extension housing an indoor swimming pool, which, the company said, makes it an ideal project for mini-CHP. For maximum operational efficiency, it is important to ensure that there is a constant demand for heat in order to ensure continuity of power generation – and this is provided by the pool. The heating system was designed by consulting engineers Michael Popper Associates and a spokesman said: “We selected the Dachs unit as it was ideally suited to the project in terms of capacity and size. We have had no problems with the unit and, indeed, we have gone on to use the same product in a subsequent project.” An innovative solution has been found to house the equipment which avoids any visual impact on the property. The Dachs unit, together with a condenser and a buffer vessel, are installed in the garage, mounted at high level on a specially designed platform which still allows adequate room for the householder to park his car underneath. To provide access to the unit as well as light for maintenance work, a domed roof light has been installed above the units. Thanks to the unique exhaust gas condenser, the Dachs unit generates up to 15.5kW of heat which feeds into a 750 litre buffer vessel. This is connected to the heating circuit, also served by two condensing boilers, which supplies both the radiator system within the original property and the swimming pool in the extension. The heating system was newly installed and work involving the Dachs unit and ancillaries was overseen by technical support staff from Baxi-SenerTec UK. Particularly important in a residential location, the Dachs unit is extremely quiet in operation, avoiding any noise issues for neighbouring properties. Power generated by the Dachs unit is used to supply household demand and this displaces an equivalent amount of expensive grid electricity. In addition to the substantial cost savings provided the electricity produced makes CHP an effective carbon reducing micro-generation technology. As part of the Archbishop McGrath Catholic High School’s £20m relocation to Brackla, in the heart of Bridgend, a new state-of-the-art school facility has been created. With environmental considerations paramount, a durable and sustainable cladding solution was required. For this, HLM specified Artema cladding from Carea. A £20m investment for a new building was recently agreed, with the new school offering 8,500m2 of space including science laboratories and music suites as well as an all-weather sports pitch. 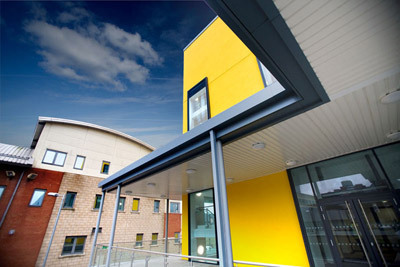 Main contractors Leadbitter and HLM designed the school to achieve a BREEAM (2008) ‘excellent’ rating. To provide this ‘green’ school facility, the building’s design incorporates large amounts of insulation, recyclable materials and the use of local manufacturers and labour wherever possible. Carea was chosen to create an envelope that – comprising of 95% natural minerals – also offers superb thermal insulation, protecting the building against changes in temperature and eliminating thermal bridging. Requiring minimal maintenance, the Artema panels are designed and manufactured to be non-porous. As such, this ensures that they provide an economical solution and long-term resistance to graffiti, weather conditions and climate. They are riven texture and basalte colour, have been installed across three storeys and cover approximately 25% of the school’s total external walls. The dark grey 16mm Carea panels provide the school with a contemporary appearance, complementing the building’s modern architecture. Installed by specialist contractor, Central Cladding Systems, the Carea Artema system is supported with a comprehensive range of joint fittings. This enabled Central Cladding Systems to efficiently anchor the cladding panels to the building’s cladding support system. Held firmly in place, the cladding helps to create a thermally efficient building envelope whilst matching the architect’s creative vision. Lime Technology’s Hemclad pre-fabricated wall panels are being used for the construction of a new climate-controlled storage facility at The Science Museum at Wroughton in Wiltshire – set to house archives and objects from the NMSI family of museums. NMSI comprises of the Science Museum, the National Railway Museum and the National Media Museum. The decision was taken to procure a building made from low-carbon, natural materials that required minimal energy to run and to be powered by a new on-site renewable energy scheme. To achieve the project’s 16-week timeframe, thermal performance and humidity control targets, an environmentally friendly and quick build solution was required. Combining Tradical Hemcrete and a timber cassette, the purpose-designed pre-fabricated Hemclad panels proved the natural choice to regulate humidity and help maintain a stable internal temperature. Hemclad provides high levels of insulation, thermal inertia and negative embodied carbon. Using the environmental credentials of Tradical Hemcrete, the cladding system reduces energy load and regulates the humidity within the building in line with BS 5454 – the British Standard Recommendation for Storage and Exhibition of Archive Documents. Hemclad can be supplied in a range of U-values from 0.10 W/m2K to 0.25 W/m2K to help provide a thermally efficient building envelope. Its combination of thermal inertia and insulation prevents fluctuations in temperature to create a stable environment and greatly reduce energy usage. In 2009, the museum joined the 10:10 project – a global warming mitigation campaign – in a bid to reduce its carbon footprint. With the specification of Hemclad, the Science Museum will continue to improve its environmental performance while ensuring its valuable and historical archives remain in optimum condition for many years to come. 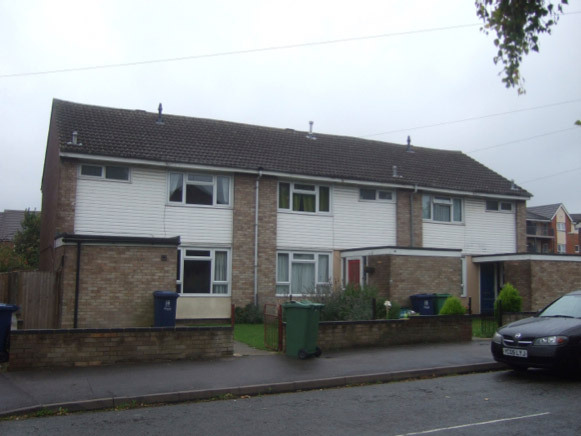 Commencing on site this month, Anglian will insulate timber framed terrace houses as part of the council’s pilot scheme being undertaken in the Rose Hill Estate which is located on the south-east outskirts of Oxford. Using the Structherm EWI system, a 60mm phenolic board will be applied to the walls and covered with a basecoat render and reinforcing mesh. An acrylic finish will then be applied to the front and rear elevations of the house and a brick effect render to the gables. Residents will also be given the choice to select the colour of the render before it is applied to their home. At Crown Woods College, BBES’ Modular Systems+ division has designed and supplied multi-service 3D corridor modules that incorporate full M&E services as well as operating as air conditioning ducts for the classrooms. Lined with acoustic foam, the air path fulfils the design noise criteria to create an ideal learning environment for this new facility. Using the latest lean construction methods and off-site fabrication techniques, BBES has delivered the completed 3D modules and modular risers installed on site for an efficient and safe installation. Manufactured by BBES at its Modular Systems+ facility, this allowed site construction to run concurrently, making significant savings on the project timeframe. BBES is able to maximise project efficiency while ensuring quality management is maintained throughout each process. The modular arrangement also eliminates material wastage, helping to maintain projects sustainable targets and provide significant cost and time benefits compared to traditional installations. Greg Barker, Minister for Energy and Climate Change recently visited Rampton Drift in Longstanton, where energy-saving technology is being retro-fitted at 13 former barracks properties which will eventually form part of the new town of Northstowe. Jablite Dynamic Insulation is one of the solid wall insulation solutions that are on trial at Rampton Drift. Power savings will be charted and it is hoped other families will be encouraged to cut their carbon footprint. 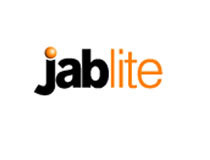 “We are very pleased to be part of this excellent project which is leading the way in preparations for the Green Deal,” Richard Lee, managing director at Jablite, said. The Rampton Drift project will examine a number of energy-saving measures including insulation, solar panels and super-efficient boilers worth a total of £320,000. All will be retrofitted in houses, which were built between 1956 and 1970. 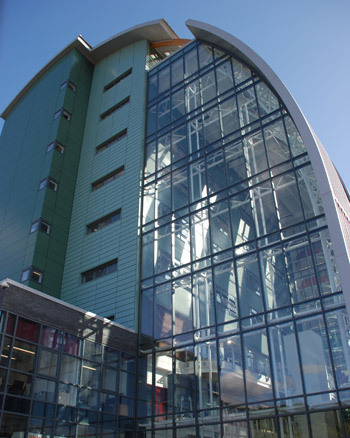 A trio of architectural aluminium systems from leading UK supplier Kawneer proved a “key element” to the redevelopment of a city college, for reasons including sustainability, robustness and aesthetics. Kawneer’s AA110 curtain walling was used on the student refectory that provides panoramic views of Sheffield as well as the walls of the flagship atrium. Glazed strip sections were also used on the atrium’s curved roof, complemented elsewhere by AA601 top/side-hung casement and AA602 pivot windows and series 190 heavy-duty commercial entrance doors. Winner of a regional award for outstanding contribution to improving air quality, the £60 million Sheffield City College is home to 6,000 students, 600 staff and a host of sustainable features including a trio of roof-mounted 15m-high wind turbines, the first of their kind to grace the city skyline. As well as these, the iconic purpose-built college also features photovoltaic panels, a rainwater recycling system, green sedum roofs, a balancing pond to channel water for re-use, natural ventilation of all rooms, high-efficiency light fittings and an additional turbine at ground level. The three-year project was completed in four phases by main contractor JF Finnegan – the first being a nursery, the second a three-storey catering wing, and the third the atrium building and seven-storey tower containing 50 teaching rooms including the National Enterprise and Health and Social Care Academies. In addition, there is an aviation wing, training salons, dental and science laboratories, learning resource centre, spa and restaurant. 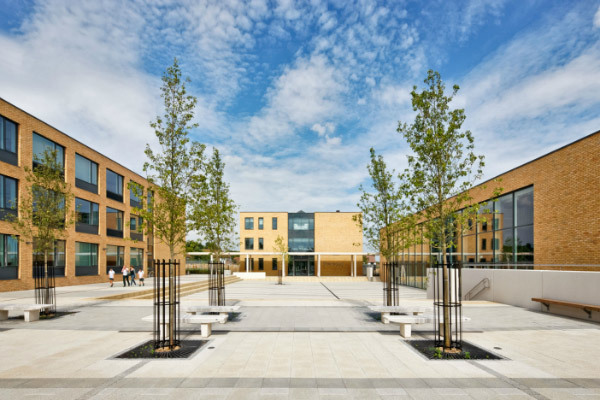 The final phase included a sports hall, outdoor sports pitches, landscaping and new college entrance, with students moving into each new phase to allow demolition of the old buildings. Architect Mike Hall said: “We did work closely with Kawneer and produced our details in accordance with the Kawneer system as we have used Kawneer products in the past with great success and Kawneer were extremely pro-active in helping us produce the details and input into the spec. We had no issues in accepting the Kawneer product as a contractor’s proposal. “The Kawneer systems are a key element, providing natural light into the atrium space and integrating smoke vents, providing a fantastic panoramic view of the city from the refectory. “The college, with its use of sustainable building techniques and renewable energy technologies, is high on the sustainability agenda and it was extremely important that the building materials were reflective of this. The use of an aluminium system with high recyclable properties was important. Patients are benefitting from a comfortable environment using low energy cooling and heating in the new Pain Centre at the Salford Royal Hospital which is undergoing a £200 million modernisation programme. The Manchester and Salford Pain Centre (MSPC) is located in a new purpose-built extension to the existing Irvine Building and is part of the hospital’s extensive building programme which is being phased over five years. As a designated low energy project, energy and running costs combined with aesthetic considerations were drivers for the Pain Centre’s fit-out in addition to patient and employee comfort. To this end, the consultant Engineers – AECOM (formerly Faber Maunsell) – specified chilled beams for their energy efficiency, low noise levels and comfort benefits. Waterloo’s active chilled beams and devices were selected and fitted by CMB Fylde Engineering into every room to supply cooling and heating. Active chilled beams provide a compact, energy efficient and aesthetic system for the delivery of heating and cooling and provide an excellent air pattern with good throw characteristics. Chilled beam technology offers an opportunity to save energy, reduce mechanical noise and improve indoor air quality in retrofit, renovation and new construction projects. The potential energy reduction of using chilled beams instead of a traditional air-conditioning system can be as much as 50%, depending on the type of system, climate and building. The move towards more sustainable building designs combined with concerns about assuring a proper indoor environment for the building occupants increasingly sees chilled beams being specified over traditional air handling units.